Located in downtown West Branch, The Highway offers elevated pub fare, 16 taps, and an extensive cocktail menu. The Highway Brewing Company opened in January 2018 and is located in downtown West Branch, Michigan. 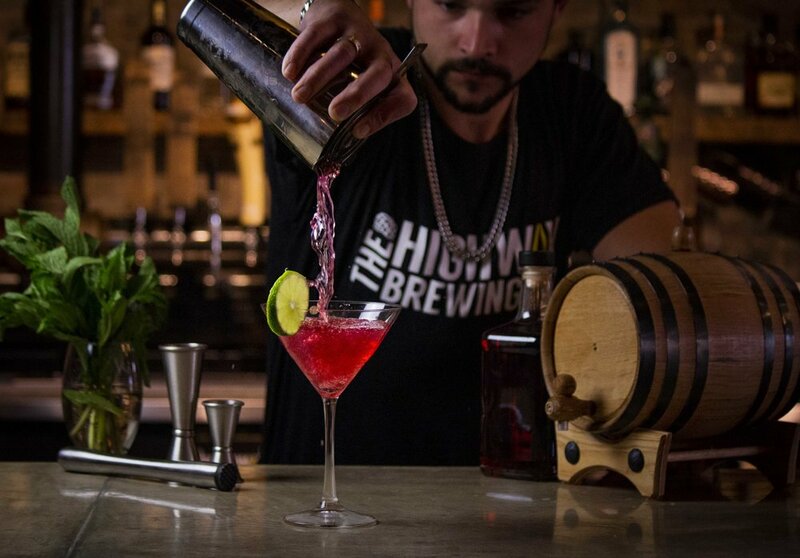 Serving delicious flavors in a historical building, The Highway offers a unique atmosphere. 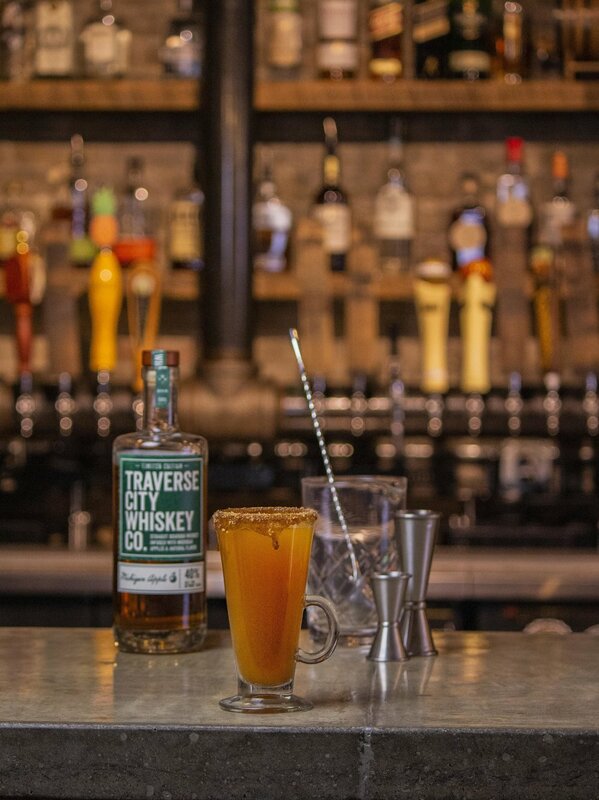 With 5 flagship brews and rotating seasonal offerings all brewed on site, The Highway also features a carefully curated cocktail menu that highlights Michigan spirits. The Highway’s interior, designed by owners Ethan and Erin Resteiner, pays tribute to the history of the building as the original West Branch Fire Hall. The multi-level brewpub offers the choice to observe Houghton Avenue through the original style windows in the 2nd floor lounge, catch some fresh air on the 2nd floor rooftop patio, or enjoy the main dining room complete with a repurposed brick bar and operating glass garage door. Chef's choice of assorted meats, spreads, and cheeses, served with fresh fruits and custom accompaniments. Small, savory, and homemade with fresh scallions, sharp cheddar, and diced jalapenos. Finished with an Asian ginger sauce. Fresh avocado, sliced and dipped in our house glaze, then fried and rolled in crushed tortilla chips. Comes with green goddess dressing. Savory bacon-wrapped apple sage sausage served with our own mustard sauce. Basket of our signature spiral cut fries. Jumbo bone in wings, tossed in one of our signature sauces or served plain. Served with blue cheese dressing and celery sticks. Yup. You didn't know pigs could fly did you? (4) 2 oz tender pork wings on a single bone served with one of our house sauces or plain. A foot long grilled hoagie, stacked with tender roast beef, melted cheese, roasted red pepper and grilled sweet onions. Crispy fried chicken stacked between a grilled cheddar biscuit bun, then topped with mayo, sweet butter pickles, and pimento cheese. Seasoned chicken breast topped with sauteed red pepper, onions, lettuce, tomato, and melted Gouda cheese. Served on our fresh bakery roll. 12" flour tortilla bursting with flavor. Fresh cut greens, creamy Caesar dressing, shredded Parmesan cheese, and your choice of either grilled chicken or steak. 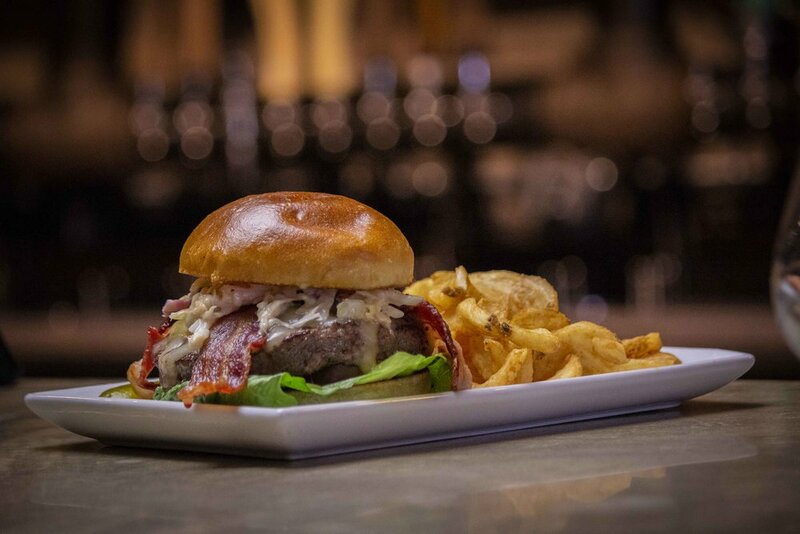 Angus and sirloin burger with thick sliced bacon, lettuce, tomato, white cheddar, and our house coleslaw. Served on a grilled bakery fresh roll. Angus and sirloin burger topped with pepper jack cheese, lettuce, tomato, and sauteed jalepeno peppers. Served on a fresh bakery roll. Ground lamb mixed with ginger, curry, and fresh garlic. Topped with fresh crisp lettuce, sliced tomato, sweet onions, and cool dijon sour cream sauce. Served on a grilled bakery fresh roll. Grilled quinoa patty packed with roasted garlic, lentil, carrots, brown rice, and bell peppers. Served on our grilled bakery fresh roll. Angus and sirloin burger with your choice of any of the following: cheese, sauteed onions, bacon, green olives, jalapenos, pickles, mayo, sauteed mushrooms, lettuce, tomato. Mixed greens topped with diced honey ham, smoked turkey breast, hard boiled eggs, cherry tomatoes, diced red peppers, cucumbers, diced bacon, and shredded cheddar cheese. With your choice of dressing. Must be 12 or younger to order from the kids menu. All kids meals include applesauce and french fries and one small beverage. 5 oz Angus blend burger with ketchup and mustard served on our bakery fresh roll. 3 lightly battered and fried, all white meat chicken strips. 4 fried fish sticks, made with 100% pacific pollack. A dark and malty beer brewed with unrefined Muscovado dark brown sugar from East Africa, Madagascar vanilla beans, Ecuadorian cocoa nibs, and sour cherry puree. This beer is not overly sweet and has a subtle hint of molasses from the brown sugar, a slight tank in the middle from the cherries, and dark chocolate flavor and aroma. Don't let its name, or color, fool you! This light bodied black ale has a smooth roasted malt flavor and a mild, balanced bitterness. Named more after its appearance than its taste. Bitumen is a black, viscous, tar like substance used in asphalt road construction. A session IPA with earth, pine, and citrus characteristics. Dry hopped with Columbus, and Cascade hops. Ogemaw County takes its name from Ogemaw Ke-Ke-To, now known as Chief Ogemaw. Born in 1794, he was elected Chief in 1815, spoke before congress in 1837, and ruled the Chippewas until his death in 1840. A refreshing ale brewed with wheat, sweet orange peel, and corriander seeds. West Branch sits at the intersection of three Chippewa footpaths, one of which is M-55. M-55 is also one of only three state highways that extends across the Lower Peninsula from Lake Huron to Lake Michigan. This stout is brewed with lactose and flaked oats to produce a smooth and creamy beer. It has a rich roasted aroma with subtle hints of chocolate from the malt. Hobo City was where hobo's would gather in the early 1900's while passing through West Branch. It was located on the banks of the Mill Pond near the West Branch Flour Mill. A malt forward amber ale with a honey like sweetness and a balanced hop bitterness. The name really needs no explanation, but the brewer insists - he must explain himself. With his future wife's permission, this beer was brewed the day before the wedding - with his future wife's permission - end of explanation. TC Whiskey Co. Bourbon, Campari, Sweet Vermouth. Served on the rocks. TC Whiskey Co. Bourbon, sugar, bitters, orange and a cherry. Served on the rocks in a smoked glass. TC Whiskey Co. Cherry Whiskey, lemon juice, simple syrup. Served on the rocks. TC Whiskey Co. Bourbon, simple syrup, mint, and lemon. Served on the rocks. Coppercraft rye whiskey, Cognac, vermouth, benedictine, bitters. Served up. TC Whiskey Co. Bourbon, simple syrup, mint and bitters. Served with crushed ice. Two James Nain Rouge Absinthe, Coppercraft rye whiskey, Cognac, sugar, bitters. Served up. Mammoth vodka & Spauldings Coffee Liqueur. Served on the rocks. Mammoth vodka, Spauldings Coffee Liqueur, and cream. Served on the rocks. Valentine Vodka, local maple syrup, ginger beer, and thyme. Mammoth vodka, triple sec, lime juice, and cranberry juice. Served up. Mammoth gin, maraschino liqueur, creme de violette, lemon juice, and simple syrup. Served up. Valentine gin, vermouth, and olives. Coppercraft gin, Campari, sweet vermouth. Served on the rocks. Valentine gin, maraschino liqueur, green chartreuse, and lime juice. Served up. Coppercraft gin, lemon juice, simple syrup, and soda. Coppercraft gin, simple syrup, lime juice. Served up. Coppercraft gin, Grand Marnier, sweet vermouth. Served up. Detroit City Aquavit, vermouth, Campari. Served on the rocks. Red 8 Silver Rum, Coppercraft gin, limes wedge, bitters, and soda. Tequila, triple sec, lime juice, simple syrup. Copper Kettle spiced rum, orange curacao, raspberry syrup, lime juice, and seasonal berries. Served with crushed ice. Red 8 silver rum, lime juice, simple syrup, mint, and soda. Copper Kettle spiced rum and ginger beer. Di Saronno, TC Whiskey Co. Bourbon, lemon juice, simple syrup, egg white. Served on the rocks.